An urn of shells on the NMWC back porch. Every time I come to the Mailer Center in Provincetown there is some new discovery I make, usually accidentally inspired by something in nature. The landscape, the way things work here has a certain magic, a magic that for me makes the veil between the natural world and the inner life incredibly thin. One day I was working on a project at the Mailer house. I took a cigarette break, and for as many times as I’ve stood on the back porch I saw something I’d never noticed: several urns overflowed with oyster, clam, scallop, and mussel shells. The NMWC admin came outside to say hello. 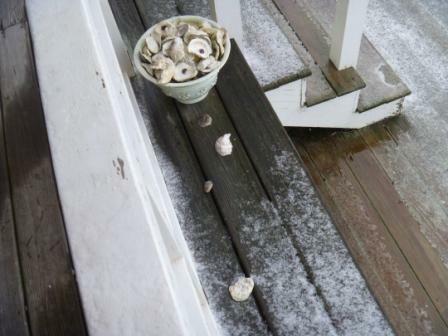 Sure enough, the porch was littered with bivalve shells. 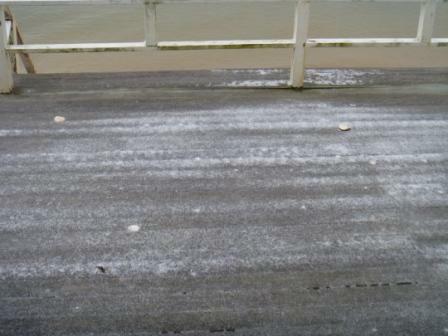 Look closely -- you can see some of the scattered shells under the light dusting of snow. “That’s the seagulls that do that,” he said. I know seagulls are strong, but I was still amazed. 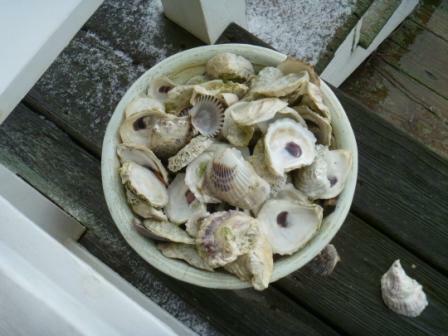 Some of these shells indicated that their owners had been pretty large animals (a live oyster or clam can actually weigh quite a bit, you’d be surprised), and Norman’s porch being, obviously, a popular spot might mean the birds would have to carry some of these creatures several miles. This struck me. As usual, I had come to Provincetown not just with piles of work to do and high hopes of getting it all done, but also with things to think about, understand, process, sort. In some cases, I realized, some of these issues went back as far as a couple of decades. Each of these things was a heavy bivalve I’d been carrying but had never been ready to let go, smash open, process, and finally, resolve. I left the Mailer house that day with a new sense of what lie ahead of me beyond writing. I’ve spent the past week and half smashing open and digesting a lot of things—some not so tasty, some going down not the way I’d expected, others nourishing me in better ways than I’d have imagined. Now the only thing I have to do is figure out what I’m going to do with the shells. Posted on January 27, 2011, in Deep Thoughts & Fun Stuff and tagged Bivalves, Norman Mailer Writer's Colony, Provincetown, Self Improvement. Bookmark the permalink. 3 Comments. Tammy, you absolutely crack me up!! I can’t wait until we can get together and party again so you can crack me up in person!